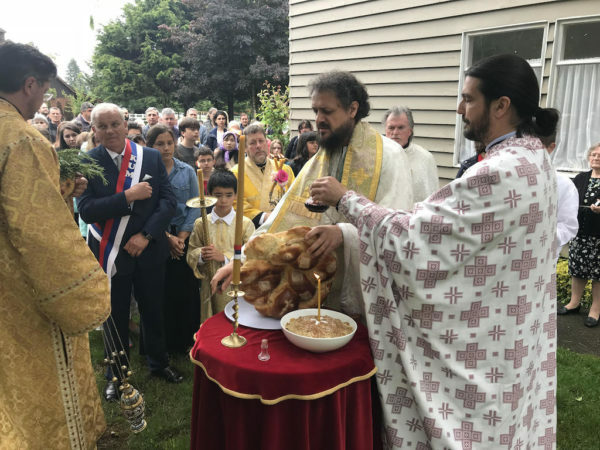 On the Seventh Sunday after Pascha, May 20, 2017, parishioners of St. Sava Church in Seattle celebrated their Patronal Feast Day – Transfer of the Relics of St Sava. His Grace Bishop Maxim of Western America served the Divine Liturgy together with Rev. Protopresbyter Serafim Gascoigne from the Church of the Holy Protection of the Theotokos, Seattle, Rev. Protopresbyter Irenaeus Williams from the Holy Resurrection Church, Tacoma, and parish priest Rev. Zoran Aleksic. After reading of the Holy Gospel, Bishop Maxim spoke about the blessing of our Lord that assured the Apostles, during this period from His Resurrection to Ascension, that He is the Son of God and the Redeemer of the world. We also, as His disciples, receive from these Feast days the comfort, joy, strength, and at the same time the knowledge that the Lord Jesus Christ is with us until the end of time.